As far as I can remember, misting has always been part of my beauty routine, mostly with thermal water. You see my mum, who is in her early 70’s, has the most amazing skin thanks to the simplest beauty routine of all. Three steps: Mist with thermal water, use a cleansing milk, rinse, more thermal water and finally a good hydrating cream and she is done. I, on the other hand, don’t enjoy cleansing milk so I replace it with a cleansing gel. However, I am a firm believer of misting to the point that I mist beyond my morning and night routine and do it throughout the day. I mean, some need more lipstick or to fix their makeup, I mist. So, one day in the office, we all talked about our beauty routine and naturally, misting came up. Questions like "Do you mist? ", "What is your favourite?" and "When do you mist" came up, and just like that, we decided to make it an article for page five so we can each share our experience and also what are the ones that we prefer because, let’s face it, not every facial mist is created equal. But first, here are some reasons why we think you should incorporate misting in your beauty routine. Mist with SPF can help you protect your skin when out and about. The first thing I do when I wake up at 6 am is to mist my face with Caudalie Grape water and head straight for coffee. It not only wakes me up but also my skin. I particulary enjoy the fact that I don’t need to blot after spraying this one. Once two cups of coffee are down, email and social media checked, I head back to my bathroom where this time I mist with thermal water. My favourites are La Roche Posay and Avene. Then, I use my cleanser, rinse with water and then mist again with thermal water to take off any particles found in the tap water. And then I moisturise. Same thing at night except for the Grape water. As I've mentioned earlier, misting for me is not just a morning and night routine; I do regular "touch-up" throughout the day. So, on my desk, I keep a small bottle of Caudalie Grape water, as well as the Caudalie Beauty Elixir in 30 ml. I am actually obsessed with the latter and I do carry it with me everywhere. I personally love the smell as it not only refreshes my skin but it also acts as a mood lifter. Whenever I spray it, my other half asks me what it is as it just smells so good. It feels nice on the skin too and it wakes you up while keeping your skin smooth. I always spray it in the middle of the afternoon when I feel my energy has gone slightly down and once more just before heading out to a dinner. Last but not least, when I am out and about, I use the Bioderma Hydrabio water’s care SPF 30. Amazing. It refreshes and protects at the same time plus it sets in quickly. I wish this one came out earlier for all the years I have been seating outside for coffee and worrying if my SPF is still working. ** click on the product name to view where to buy it. I’ve always had a bit of a phobia when it comes to misting my face, it’s the idea of putting something watery (which then feels like more dust and dirt will cling to my face) and I am extremely acne-prone. But I can’t decide which I’m more terrified off, pimples or wrinkles, both are pretty bad and with the air con blasting in THE FIFTH COLLECTION office (protect the precious goods at all cost! ), I do notice my skin drying up and fine lines appearing on my forehead!! Bad bad news. I was recommended the SK-II Mid-Day Essence Spray which, to be honest, doesn’t smell that great. It is the case for most of the SK-II products, but psychologically, I like the smell because it feels like there is really zero fragrance added. It is supposedly infused with their signature Pitera (a by-product discovered in sake breweries) and a “MoistureLock Complex” which I honestly have no idea what that means but I will assume that this product is meant to whiten and moisturise. It worked great for a while, but I found myself breaking out more than usual after a few weeks of using it. This also happened to be when I continued using SK-II products in Singapore after coming back from London. Perhaps because it was much drier in London, that’s why the products worked best for me there. So this mist is now my go-to for travelling, perfect for those plane rides and winter countries! Innisfree Jeju Lava Seawater Mist is my current favourite (together with Aritaum’s Baby Mist in Tea Tree that is not photographed here). It supposedly contains lava sea water (I’m guessing it's seawater that is near a volcano?) and coconut oil which acts as an occlusive (i.e. creates a layer over the skin to prevent water loss). I have been using it for more than 2 weeks and have not experienced any breakouts and it has a lovely, refreshing smell. I much prefer the way it sprays onto the face as compared to the Aritaum one! 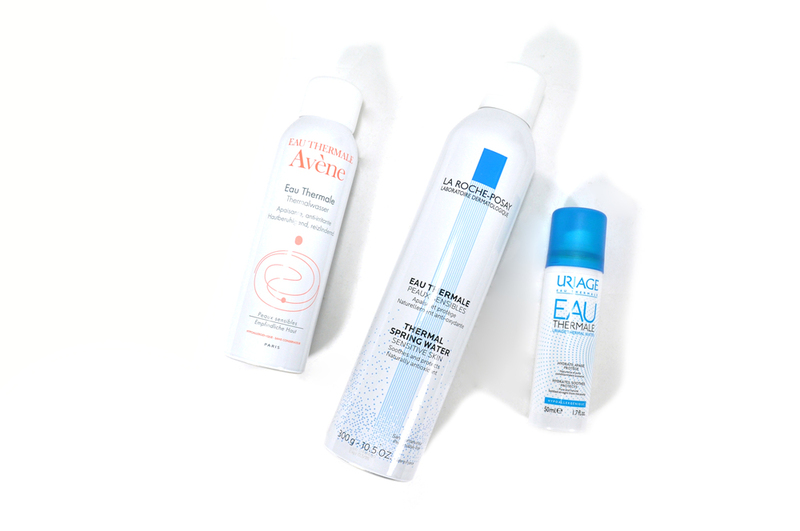 So while I have always been a mist believer, I do think it’s important to find one that suits your skin type MID-DAY. For example, I have very oily skin which may lead me to start oil-blotting or over-cleansing, but if I look closer at my skin, I do see signs of dehydration which may be why my skin is producing so much oil! So be sure to really take the time to observe your skin midday. Despite having a very detailed skincare routine, misting has never really been a part of it. To me, it was kind of a redundant step in my routine as I thought it did not make much of a difference. 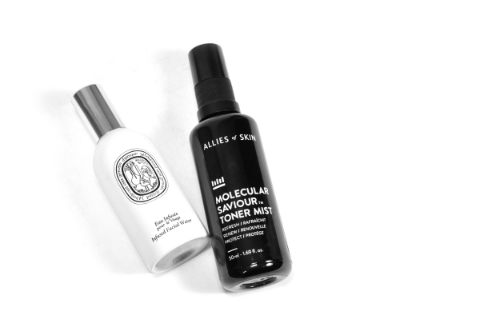 However, when I was introduced to the Allies of Skin Molecular Saviour Toner Mist, I decided to put one foot into the misting game as I am a huge fan of their products. Today, it has become a must-have step after I cleanse my face and also after I apply an overnight face mask, which is probably a little different from what people perceive misting to be (it usually is an afternoon affair to refresh your face). I like how it makes my skin feel tighter after I cleanse my face, especially after that extra spritz that adds and seals nutrients after I apply a deep hydration mask. The great thing about the mist is the multi-purpose qualities of it. Besides using it like a toner, you can also use it throughout the day or on those dehydrating plane rides. When I was in Beijing, this was my must-have in my bag because of the antixoxidants and, basically, nutrient reservoir that this 50ml bottle packs. Ultimately, I still like using this more after cleansing rather than throughout the day as I find that it takes a little longer to dry and is a bit too generous when sprayed sometimes. On my office desk now I keep REN’s Flash Defence Anti-Pollution Mist with me at all times, what I love about this mist is that it absorbs into the skin almost instantly and that the nozzle sprays out JUST the right amount of fluid. It also spreads very evenly. I am a sucker for how well engineered this nozzle is as well as the light scent that instantly refreshes me when I’m feeling a little tired looking at Excel sheets. For those who wear more makeup, I highly recommend a mist like REN’s because of how you can control the dosage and how quickly it absorbs into the skin. It’s the perfect pick-me-up in the day that also protects your skin from environmental pollution because it includes Biosaccharide Gum. This creates a shield-like layer on your face to prevent the pollutants from attacking your skin. So, from someone who has never "misted" for the past 25 years of her life, consider me "de-mistified" on my 26th.